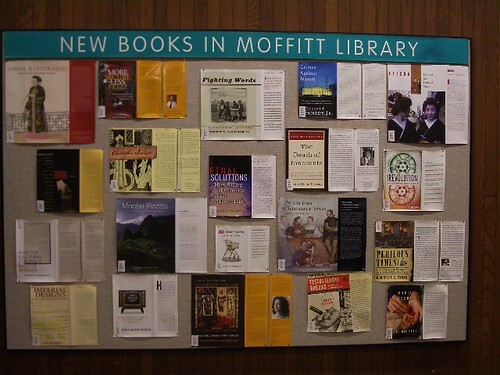 a way to keep up with the new books at Moffitt Library, originally uploaded by Raymond Yee. On persevering: I’ve been working on it seven years. It is starting construction as we speak. It will be completed in the spring of 2011. On touring Moffitt Library: I walked through with a lot of other architects who were all competing for the project. I was there in the morning, in the afternoon. I didn’t go at 2 a.m. when you see it in its true form. On renovating Moffitt: It is 1960s concrete brutalist. I think the bones of Moffitt are good. I wouldn’t dynamite it. I’d clear it out, open it up. Bring some daylight in, update the furniture, make it comfortable. It’s dreary at the moment. More at the San Francisco Chronicle, July 5, 2009.